Before starting with the nuts and bolts of the benefits of nutmeg, just a short little introduction to what it is and where it comes from. 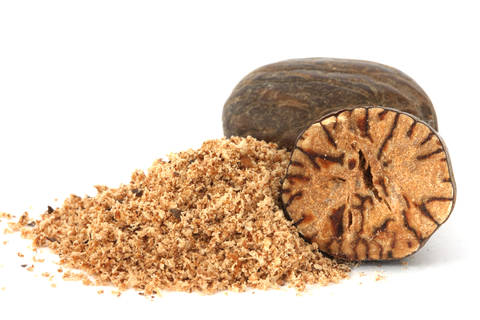 Nutmeg is the dried kernel of the seeds of and evergreen tree native to the Indonesian Molucca Islands. This tree is cultivated for two spices derived from it’s fruit: nutmeg and mace. It is also a commercial source of an essential oil and nutmeg butter. Through the years the benefits of nutmeg have always been as a love potion, which it is, but it also has so many other medicinal benefits that will most definitely surprise you. If the recipe you are preparing does not specify using grated nutmeg, use only ¾ tsp of the grated spice for every 1 teaspoon called for in the recipe. And remember it is best not to store grated nutmeg, rather just grate enough of the spice for whatever dish you are preparing. Generally we would use nutmeg in goods like spice cake but some people say you should try it in a fruit salad or as a topping for steamed vegetables such as cauliflower, sweet potatoes, spinach, asparagus or cabbage. Eases muscle spasm and pain. Ground Nutmeg mixed with water can be used for ringworm as well as exzema. Nutmeg essential oil can be applied to numb toothache which awaiting dental help. And also pain relieving in rubs for home remedies for arthritis, nerve and muscle pain. It is an effective liver and kidney detoxifier (but remember to never try alternate natural medication without the permission of your Medical Practioner). Can help clear up congestion from colds, it is used in many cough mixtures. Nutmeg oil helps in removing bad breath. It is also antiseptic in nature and is effective for toothaches and aching gums. If you have trouble sleeping at night drink a cup of milk with some nutmeg powder. This will help you relax and induce sleep.